Details relating to the Italian Commemorative of 2013. 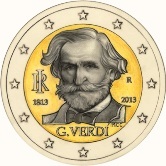 This coin commemorates the birth of the famous Italian opera composer Giuseppe Verdi. After some initial failures, Verdi’s genius was recognized with the creation of the opera Nabucco. Verdi’s operas are now part of the standard repertoire of the leading opera houses around the world. A life like bust of Verdi fills the inner circle. It is based on the portrait of Verdi by Giovanni Boldini. The country of issue is shown at nine o’clock with RI where the I is superimposed on the R. The mint sign R, is seen at three o’clock. Verdi’s date of birth and the year of issue are to be seen at eight and four o’clock respectively. At the bottom we see Verdi’s name and the initials MCC of the designer. Return from Italian Commemorative 2013 to euro coin collector.